A BIG MERCI for making the the SUMMER GARDEN PARTY SALE a huge success and helping to get me back to Paris in October. I'm celebrating the end of the Summer sale with a melange of croquembouche.. 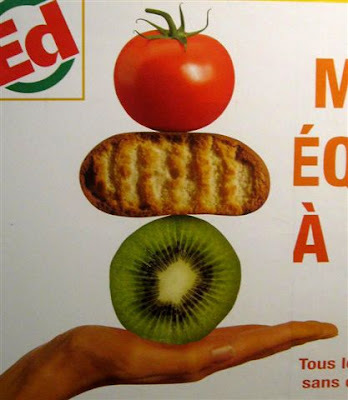 The French have a propensity for height - they seem to love stacked cakes. i.e. 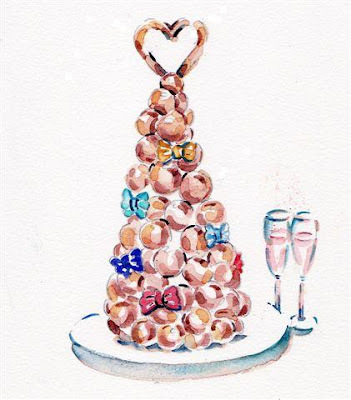 The wedding cake known as the croquembouche (pronounced crow-come-bush) meaning ''to crack, crunch or crumble in the mouth''. 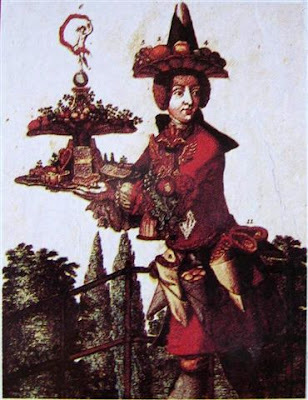 I saw this sign hanging on patisserie Gerard Mulot's door - to prove he is a member of the French pastry guild or some such thing. Like he needs to prove anything!? I love the stacked something or other the server is holding. 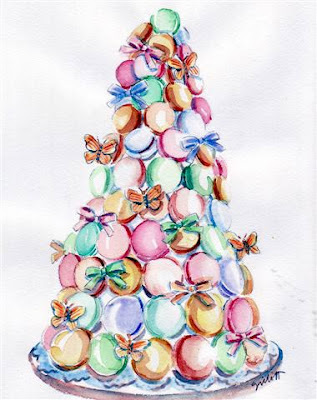 "Pink" loves stacked things too and to prove it, she sent me this photo of her croquembouche birthday cake, hoping to persuade me to do another watercolor. Croquembouche like this one. Towers of macarons instead of the traditional pile of choux-filled carmelized profiteroles. 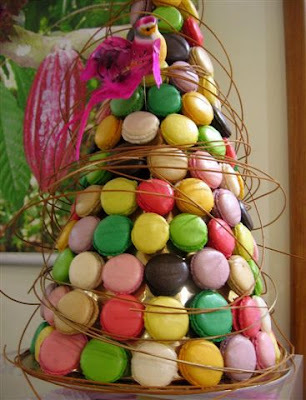 A pretty wedding cake of macarons. In my opinion Gerard Mulot is the master of these towers of power. His Fall version on a base of fall fruits and leaves, with the occasional bird pecking at the macarons - Poetic. 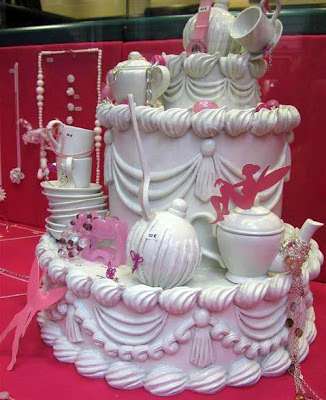 A favorite example of "French stackery" is this pile of crockery on a porceleine gateau in a shop window.But my all time favorite is this poster I kept seeing in the Metro. Don't even ask me what it was for. I just LOVE the stacked shapes and colors - this could be my wedding gateau. I like the Metro stack, too--very cool! They're all wonderful, though, Carol. So elegant and lovely. Your newest painting is colorful and delicate. Congratulations on being Paris-bound again. You'll have lots to look forward to, and we'll benefit from lots of new inspiration for beautiful paintings, I'm sure! Hi I've been reading your blog for soo long and I finally have to ask, after another beautiful macaroons filled post, do you know where I could find a specific recipe to create these colored exquisite macaroons? I've eaten them while visiting my family in France but am completely missing them right now and don't want to make your run of the mill simple macaroons, I want the color and shape!! Any help or ideas would be amazing. 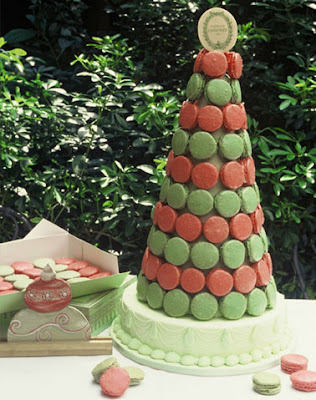 Leeza sent me this great link for macaron recipes. I plan to try it too! oh my goodness! there I am.. and there is such a fab blog entry! I can see, you are always on the images association-imagination ! the blacked-out face woman is very funny, her anonymous desire is becoming a really punishment ! We were enchanted by France before, but you do so much to raise our level of intensity! In short, I love your blog. "Like these striped shoes in another window..." Please let us know where they are from. Oooh , stacks and stacks of happiness and sweet success. 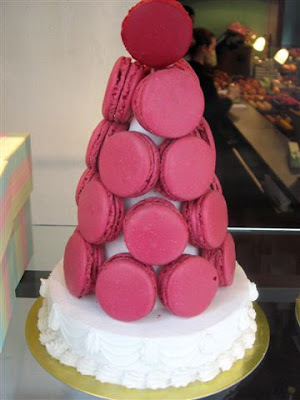 Hm, that tower of macarons from Mulot is mighty , mighty tempting...yum. Oh no I haven't had breakfast!!! Would munch a profiterole or two from those tall Croquembouches and be totally delighted. I may go to Paris in October too, so we have to check our schedule. That would be great to see you there and go to the patisseries together. I came across your blog somehow, and I am so glad I did. It is just so BEAUTIFUL! What an inspiration your work is. Just Lovely!! And a BIG MERCI to you for the link to the snickers macaron recipe! I made a lucky find today, and in your honor I purchased a box of your cocoa powder the ____L'ancienne brand. I've frequently been tempted to send for some from Amazon....but felt uncharacteristically cheap about paying for shipping. So when I found it in my local cheese store, I felt my patience had been rewarded. As for les croquembouches, I have been contemplating making one for our annual office holiday party. Maybe this year...If I have time between reading your posts, making macarons, and restraining myself from fricaseeing les rabbits. Detente, you know. The painting is fabulous -- I love it! Keep up the enchanting work! Oui! Nous aimons les pièces montées! 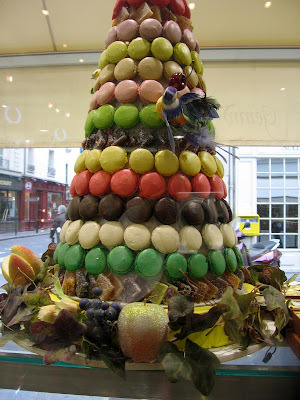 macarons has pushed some bakers and cooks (mostly in Paris and big cities)to change their croque-en-bouche!